"Her students range from the learning disabled to the gifted. 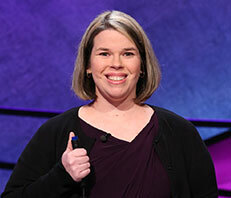 From Martinez, Georgia, this is..."
2013 Teachers Tournament 2nd runner-up (semifinalist by wildcard): $25,000. Becky taught 7th grade social studies at Burke County Middle School in Waynesboro, Georgia at the time of her appearance. #6715, aired 2013-11-22 Mary Beth Hammerstrom vs. Becky Giardina vs. John Pearson 2013 Teachers Tournament final game 2. #6714, aired 2013-11-21 Mary Beth Hammerstrom vs. Becky Giardina vs. John Pearson 2013 Teachers Tournament final game 1. #6712, aired 2013-11-19 Patrick Dillon vs. Anne Baxter vs. Becky Giardina 2013 Teachers Tournament semifinal game 2. #6709, aired 2013-11-14 Becky Giardina vs. Maryanne Lewell vs. John Pearson 2013 Teachers Tournament quarterfinal game 4.